The long awaited ‘Our Universe’ fashion brand has finally launched, available exclusively at ShopDisney.com and Disney Parks. This is an ‘off shoot’ from Her Universe, that will also include men’s and children’s ranges. The first releases include children’s collections for Disney Princess and Black Panther, but hopefully we’ll see Star Wars fashion soon too! Read more here. The new “Our Universe” line features activewear, swimwear, footwear and accessories and is sold exclusively online and at Disney stores. The first wave of the collection is inspired by Marvel Entertainment’s Black Panther and Disney Princess, with a Star Wars line coming soon for kids, tweens and adults. Several Star Wars actresses attended the 2018 Screen Actors Guild Awards, including Kelly Marie Tran (Rose Tico), Laura Dern (Vice Admiral Amilyn Holdo), and Lupita Nyong’o (Maz Kanata). Laura Dern was nominated for her role in Big Little Lies, and wore a Christian Dior Fall 2017 Couture dress. Lupita Nyong’o and Kelly Marie Tran were presenters this year – Lupita Nyong’o wore a liquid-silver Ralph & Russo Fall 2017 Couture design gown while Kelly Marie Tran wore a strapless Mary Katrantzou Resort 2018 gown. In support of the Time’s Up movement, women attending the Golden Globe Awards chose to wear all black. The New York Times featured an article following Laura Dern getting ready for the event – read more here. Stars are officially in style. In an article on Independent.co.uk, writer Sarah Young notes the popularity of Star Wars, and even mentions the starry dress by Monse that Daisy Ridley wore to The Last Jedi premiere. The galactic ‘starry’ theme has appeared in recent collections by Dior and Chanel, as well as many other brands – check out the full article here. If that wasn’t enough, with Star Wars fever gripping the world you can probably guess the pattern used on the Monse dress that actress Daisy Ridley wore to the premier of the latest movie in the franchise, Star Wars: The Last Jedi. That’s right, strapless and sequined all-over, the epic frock came covered in galactic glittering stars. Star Wars actresses Laura Dern (Vice Admiral Amilyn Holdo) and Billie Lourd (Kaydel Ko Connix) appeared in a recent article on Vogue.com. The actresses talk about their personal styles, and some of their favourite fashion designer labels – read the article here. “Give me sparkle, give me life!” exclaimed Lourd who has found her style soulmates in Tom Ford and Alessandro Michele’s designs for Gucci. “Tom Ford and I have done some awesome collaborations,” said the actress of her glittering metallic dress by the American talent she wore to Star Wars premiere last month in Los Angeles. The two actresses hosted the Moët & Chandon’s Pre–Golden Globes Cocktail Party – read more here. The Hollywood Reporter interviewed Billie Lourd about being on this year’s judging panel for the the 3rd annual Moët Moment Film Festival and also about The Last Jedi – read her interview here. One fashion question: I see that you work with stylist Jamie Mizrahi, who styled you in a glittery Tom Ford for The Last Jedi premiere. What is your collaboration like? What do you look for when getting dressed for the red carpet? The Tom Ford look was very thought out. I also wore Tom for the Star Wars Celebration, the first public appearance after she passed. One was dedicated to the classic white dress she wore and the other, a nod to her hologram dress. Jamie and I thought about both for a little bit. We have so much fun together, Jamie and I. And I’ve been having such a good time with Tom. He’s so fun to collaborate with. It’s always fun to take risks. Star Wars actress Laura Dern (Vice Admiral Amilyn Holdo) won the Best Supporting TV Actress award at the 2018 Golden Globes for her role in Big Little Lies. It is great to see Star Wars actresses be recognised – Laura also won the Emmy for Outstanding Supporting Actress back in September 2017 for the same role. Watch Laura’s acceptance speech at the Golden Globes on Youtube here. For the January 25th 2018 issue of The Hollywood Reporter magazine, Lupita Nyong’o (Maz Kanata) talks about her journey to become an actor, the Time’s Up anti-harassment initiative, and the new Black Panther film – read the full article here. ….a fashion icon whose image has appeared on four Vogue covers (the first black actress to do so), and who has a lucrative deal with Lancome…. Actress Reese Witherspoon surprised her friend and fellow Big Little Lies actress Laura Dern (Vice Admiral Amilyn Holdo) with a fun t-shirt with a Star Wars touch. She created t-shirts for their friends with the phrase ‘Feel The Dern’ printed in the classic Star Wars font. Check out the photos here and here – and you can even buy the t-shirt for yourself here. Captain Phasma actress Gwendoline Christie attended the Louis Vuitton Menswear Fall/Winter 2018-2019 Show, which was part of Paris Fashion Week, held in France. She looks amazing as always – check out the photos here. Princess Diarist was the last profesh(ish) thing my momby and I got to do together. I wish she was here to carry me down the red carpet in some bizarre floral ensemble but instead we’ll celebrate in true Carrie style: in bed in front of the TV over cold Coca Colas and warm e cigs. I’m beyond proud. Star Wars actress Natalie Portman (Padme’ Amidala) has joined the social media platform Instagram. Her verified account bio states that this is “My one and only social media account“. She has shared photos and videos, and even Stories on her account – follow her here. More than a thousand. And they’re all individually made, all in different fabrics. They needed dresses and gloves and jewelry. You can’t go out and buy clothes for “Star Wars.” We had a milliner. It was like M.G.M. in the ’30s. We had hats made, gloves made. We had people just making jewelry for this one sequence. The creatures would come to us naked, and we would dress them. The article points out that while the style may be foreign to us, that is exactly the point. Alongside the flowing brown jedi robes and fantastical Canto Bight gowns, the different styles in the Star Wars fashion world are meant to be quite different from what we wear and see every day. Read the full article here. The Lady Nerd spotted the perfect item for a casual Han Solo everyday cosplay at H&M – blue pants with a red stripe down the side seams! 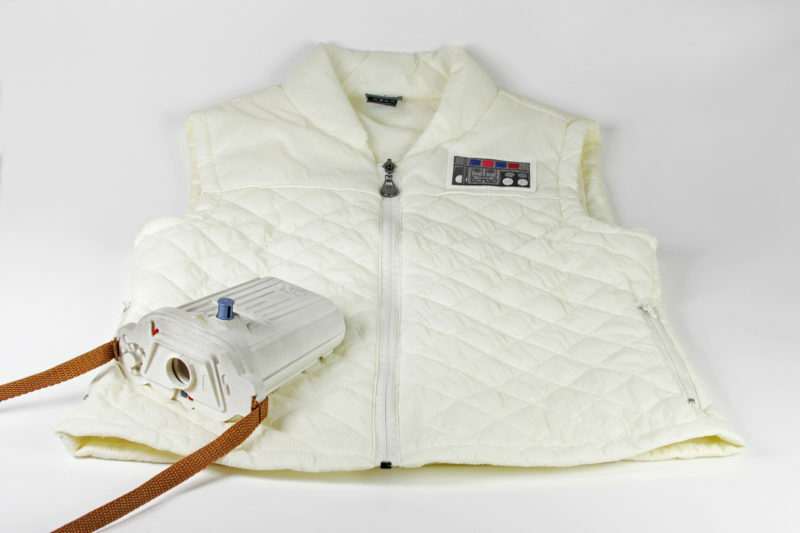 Instantly recognising them, she put together a full Han Solo outfit using items from the store – check out her post and photos here. Emily from The Stylish Geek posted a Princess Leia themed outfit to tie-in with the release of The Last Jedi. She paired a Junk Food Clothing printed Leia tee with a pleated skirt and pink bomber jacket – check out her photos here. Star Wars fan Jazz has been embarking on wearing a Star Wars t-shirt a day – for a whole year! He was also on a fan panel at Celebration Orlando, where the hosts discussed the many ways fans can create their own Star Wars fashion. Check out the article for the full interview (and check out our coverage of the Celebration panel here). A set of women’s Star Wars pyjamas at Target had some fans upset – with the Empire themed design featuring little red and pink hearts together with Darth Vader and the Death Star – read the full article here.